#1. This week's number one is an international power forward Kelly Olynyk (213-91, college: Gonzaga, currently plays in NBA). He could not help the Miami Heat (26-33) in their last game. Despite Olynyk's very good performance the Miami Heat (26-33) was edged 124-121 on the road by the Phoenix Suns. He had a double-double by scoring 28 points and getting 10 rebounds. Olynyk also added 3 assists in 41 minutes on the court. It was Heat's third consecutive loss in a row. Olynyk has relatively good stats this year: 9.5ppg, 4.5rpg, 1.8apg, 2FGP: 63.4%(97-153), 3FGP: 34.5% and FT: 79.2% in 56 games he played so far. He is currently a member of the Canadian senior national team. #2. Second place goes to an international forward Dwight Powell (211-91, college: Stanford, currently plays in NBA). 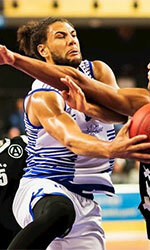 Powell was not able to help the Dallas Mavericks (26-34) in their last game on Monday. Despite his very good performance the Dallas Mavericks (26-34) were defeated 121-112 in Los Angeles by the Clippers. Powell was the second best scorer with 24 points. He also added 8 rebounds, passed 4 assists and added 2 blocks. It's Powell's fourth season with the team. This year Powell has relatively solid stats: 9.2ppg, 4.5rpg, 1.1apg, 2FGP: 70.1%(164-234), 3FGP: 25.0% and FT: 76.7%. He is in the roster of the Canadian senior national team. #3. The Canadian player who performed third best last week abroad was an international point guard Kevin Pangos (185-93, college: Gonzaga, currently plays in Euroleague). Pangos contributed to a FC Barcelona's victory against the closely-ranked Baskonia (11-12) 77-67 in the Euroleague on Thursday night. He scored 9 points in 21 minutes. 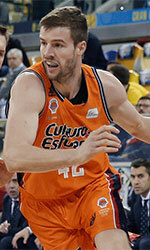 FC Barcelona Lassa (14-9) is placed fifth in the Euroleague. It was his team's third consecutive victory in a row. This year Pangos' overall stats are: 7.1ppg, 1.2rpg, 3.3apg, 2FGP: 45.0%, 3FGP: 25.7% and FT: 76.0% in 23 games. He has a dual citizenship: Canadian and Slovenian. 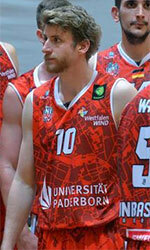 Pangos is also a member of the Canadian senior national team. #4. 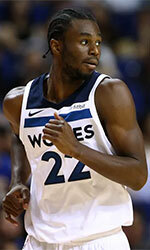 Guard Andrew Wiggins (203-95, college: Kansas, currently plays in NBA) was not able to secure a victory for the Minnesota Timberwolves (29-31) in their last game on Saturday. Despite his very good performance the Minnesota Timberwolves (29-31) were defeated 140-128 in Milwaukee by the Bucks. Wiggins scored 18 points, had 9 rebounds and dished 4 assists. Wiggins is one of the most experienced players in a team as it's his fifth year in Timberwolves' roster. He has individually a very good season with high stats. Wiggins averages: 17.7ppg, 4.9rpg, 2.4apg and 1.1spg. He used to play for the Canadian national team back in 2015. #5. Former international swingman Jamal Murray (198-97, college: Kentucky, currently plays in NBA) led Denver Nuggets to an easy victory against the Los Angeles Clippers (34-28) crushing them 123-96 in the NBA last Sunday. Murray recorded 16 points, 4 rebounds and 6 assists in 24 minutes; quite an impressive performance considering it's only his third season in pro basketball. The Denver Nuggets have a solid 41-18 record this season. It was his team's fourth consecutive victory in a row. Murray has very impressive stats this year: 18.1ppg, 4.2rpg and 5.0apg in 53 games. He used to play for the Canadian national team four years ago. #6. Guard Devoe Joseph (193-90, college: Oregon, currently plays in Turkey) couldn't help Bandirma Kirmizi (5-15) in their last game on Sunday. Despite Joseph's very good performance Bandirma Kirmizi was defeated 97-90 in Mamak by the higher-ranked Yeni (#10). He was the top scorer with 32 points. Joseph also added 7 rebounds and dished 3 assists. It's Joseph's first season with the team. This year he has very high stats. Joseph averages: 19.5ppg, 3.3rpg, 3.5apg and 1.4spg. He is a former international player as he played for the Canadian senior team six years ago. #7. International forward R.J. Barrett Jr. (201-0, currently plays college basketball in the States), who plays in the NCAA couldn't help the the league outsider Duke in their last game. Despite Barrett Jr.'s very good performance the Duke was badly defeated 88-72 in Chapel Hill by the University of North Carolina. He had a double-double by scoring 33 points and getting 13 rebounds. Barrett Jr. also added 4 assists in 40 minutes. Barrett Jr. has very impressive stats this year: 23.3ppg, 7.5rpg and 4.1apg in 27 games. He is also Canadian national team player. #8. Point guard Cory Joseph (190-91, college: Texas, currently plays in NBA) led Indiana Pacers to a victory against the Washington Wizards (24-36) 119-112 in the NBA last Saturday. Joseph scored 11 points, had 5 rebounds and dished 3 assists. The Indiana Pacers have a solid 40-21 record this season. Joseph has reliable stats this year: 7.2ppg, 3.6rpg and 3.9apg. He plays currently for the Canadian national team. #9. Former U17 international power forward Tyrell Green (201-95, college: UNLV, currently plays in Alpe-Adria-Cup) was the major contributor in a ZTE KK's victory against the leader GTK (5-1) crushing them 114-93 in the Alpe Adria Cup on Wednesday night. Green recorded 17 points and grabbed 7 rebounds in 26 minutes. It was his first game for ZTE KK this season; not bad, considering it's only his second season in pro basketball. It was the game of the round between two top 2 ranked teams in group C. His team is placed second. It was ZTE KK's fourth consecutive victory in a row. 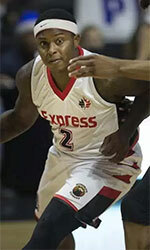 Green used to play for the Canadian U17 national team seven years ago. #10. Guard Noah Kirkwood (201-99, currently studies in the States), who plays in the NCAA couldn't help the the league outsider Harvard (0-1) in their last game on Friday. Despite his very good performance his team was defeated 88-79 at home by the Brown University. Kirkwood scored 28 points (!!! ), had 9 rebounds and dished 7 assists. There are only four games left until the end of the NCAA Regular Season. So now every game will be critical. Kirkwood's stats this season are: 10.4ppg, 4.1rpg and 1.7apg. He is a former U19 international player as two years ago he still played for the Canadian national team. #11. 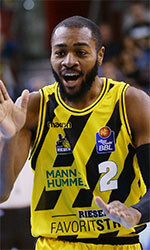 Former international forward Jermaine Bucknor (201-83, college: Richmond, currently plays in Germany) helped Gladiators edge the 14th-ranked Schalke 66-64 in the German ProA (second division) last Sunday. Bucknor scored 17 points, had 6 rebounds and dished 5 assists in 28 minutes. Bucknor has very impressive stats this year: 15.3ppg, 6.1rpg and 3.9apg in 22 games. He used to play for the Canadian national team fourteen years ago. #12. Former U17 international guard Marial Shayok (198-95, is currently at the American university) helped Iowa St. win their game against the The University of Oklahoma 78-61 in the NCAA last Monday. He scored 21 points, had 6 rebounds and dished 5 assists. This season Shayok has very high stats. He averages: 18.5ppg, 5.3rpg and 1.9apg. Shayok used to play for the Canadian U17 national team back in 2012. #13. Former international point guard Shai Gilgeous-Alexander (198-98, college: Kentucky, currently plays in NBA) helped Los Angeles Clippers win their game against the Memphis Grizzlies 112-106 in the NBA on Friday night. He scored 6 points and added 4 passes in 15 minutes. Gilgeous-Alexander's stats this year are: 9.7ppg, 2.7rpg, 3.0apg and 1.1spg in 62 games. He used to play for the Canadian national team three years ago. #14. International center Khem Birch (208-92, college: UNLV, currently plays in NBA) couldn't help the Orlando Magic in their game against the Chicago Bulls in the NBA. Birch scored 6 points and grabbed 5 rebounds. His team was edged 110-109 in the NBA. Birch's total stats this season are: 3.6ppg and 3.3rpg. He plays currently for the Canadian national team. #15. U18 international guard A.J. Lawson (201-0, currently plays college basketball in the States) helped S.Carolina win their game against the The University of Mississippi 79-64 in the NCAA last Tuesday. Lawson scored 15 points, had 9 boards, dished 6 assists and stole 3 balls in 37 minutes. Lawson averaged so far 14.0ppg, 4.5rpg, 2.9apg and 1.2spg in 27 games. He is also in the roster of the Canadian U18 national team. #1. Luguentz Dort (193-G-99, currently plays college basketball in the States) led Arizona St. to a victory against the University of California (3-3) 69-59 in the NCAA on Sunday night. Dort scored 22 points and grabbed 6 rebounds. The Arizona State University has a solid 4-2 conference record this season. There are only three games left until the end of the NCAA Regular Season. So now every game will be critical. Dort has individually a very good season with high stats. He averages: 16.1ppg, 4.6rpg, 2.6apg and 1.5spg. #2. Tyrell Gumbs-Frater (190-G, currently studies in the States) contributed to Co.Carolina's victory against the Georgia State University (3-2) 95-82 in the NCAA in Saturday night's game. Gumbs-Frater recorded 29 points (!!!) and grabbed 4 rebounds in 27 minutes. The Coastal Carolina University has 2-3 conference record this season. There are only four games left until the end of the NCAA Regular Season. So now every game is very crucial. This year Gumbs-Frater's total stats are: 9.1ppg and 1.8rpg in 26 games he played so far. #3. Godwin Boahen (180-PG-97, is currently at the American university) contributed to an easy victory against the University of Wisconsin - Milwaukee (4-3) 74-59 in the NCAA on Sunday night. He scored 22 points, grabbed 8 rebounds and dished 6 assists in 34 minutes. The University of Illinois-Chicago has 3-4 conference record this season. There are only two games left until the end of the NCAA Regular Season. So now every game will be important. Boahen's stats this year are: 14.7ppg, 3.4rpg, 2.9apg and 1.1spg in 29 games. #4. Kareem South (188-G-96, currently plays college basketball in the States), who plays in the NCAA could not help the the league outsider Texas A&M-CC (3-2) in their last game on Wednesday. Despite his very good performance his team was defeated 65-55 in a derby game by the Texas A&M-CC. South recorded a double-double by scoring 29 points and getting 12 rebounds. There are only four games left until the end of the NCAA Regular Season. South has been at the team for four years. He averaged so far 14.1ppg, 5.5rpg, 2.1apg and 1.3spg. #5. Devonte Bandoo (190-G, currently plays college basketball in the States) contributed to Baylor's victory against the West Virginia University (3-3) 82-75 in the NCAA last Saturday. Bandoo recorded 22 points and grabbed 4 rebounds in 33 minutes. The Baylor University has 3-2 conference record this season. There are only four games left until the end of the NCAA Regular Season. 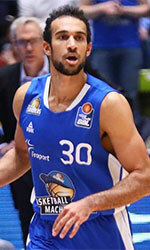 This year Bandoo's total stats are: 8.3ppg, 2.0rpg and 1.4apg in 27 games. #6. Dejan Vasiljevic (190-G-97, currently plays college basketball in the States) contributed to an easy victory against the Georgia Tech 80-65 in the NCAA on Saturday night. He recorded 21 points, 5 rebounds and 4 assists. Vasiljevic averaged so far 11.5ppg, 4.4rpg and 1.4apg. He has a dual citizenship: Canadian and Australian. Despite Vasiljevic's Canadian passport, he previously played for the Australian university national team and is probably not eligible to play for the Canadian team. #7. Mfiondu Kabengele (208-F-97, currently plays college basketball in the States) contributed to a Florida St.'s victory against the Clemson University 77-64 in the NCAA in Tuesday night's game. Kabengele had a double-double by scoring 19 points and getting 11 rebounds. He also added 2 blocks in 26 minutes. Kabengele's stats this year are: 13.2ppg, 5.6rpg and 1.2bpg in 27 games. #8. Freddy Ibrahim (190-G, currently plays in NCAA2) helped University of Tampa win their game against the Saint Leo University crushing them 95-74 in the NCAA2 last Wednesday. He scored 30 points (!!! ), had 5 rebounds and dished 4 assists. Ibrahim's total stats this season are: 10.0ppg, 4.4rpg and 3.2apg. #9. Isiaha Mike (203-F-97, currently plays college basketball in the States) helped SMU win their game against the University of Connecticut 77-59 in the NCAA on Thursday night. Mike scored 14 points, grabbed 8 rebounds and made 3 blocks. Mike averaged so far 12.2ppg, 5.3rpg and 1.8apg. #10. Eugene Omoruyi (201-F, currently plays college basketball in the States) helped Rutgers win their game against the University of Minnesota 68-64 in the NCAA last Sunday. He scored 14 points and grabbed 9 rebounds in 29 minutes. Omoruyi averaged so far 13.6ppg, 7.6rpg and 2.3apg in 24 games.